You are viewing comment page 202 of the post. View the post contents here. Windows 10 has a feature called loudness equalisation embedded in the OS (it’s working even without installing realtek drivers). It’s driving me insane, since it randomly silences various applications. Is it possible to bandaid this isuse through UNI drivers? Are you saying this loudness equalization Windows 10 feature is different from this controllable option or at least it’s that option but it’s always enabled for the Xonar card? It silences various applications completely or it just lowers their volume? Could you explain in detail the issue and how to trigger its effects? You didn’t have this under previous a Windows version? Which Windows 10 version and build number do you have installed? If the sound goes out completely, could it be the WASAPI Exclusive Mode feature that does this? You can disable this by unticking “Exclusive mode” checkboxes from “Windows Volume right click -> Playback devices -> Speakers Asus Xonar(..)-> Proprieties->Advanced tab” and see if it solves the problem. If it only lowers the volume could it be the volume reducing feature when communications are detected from “Windows Volume right click-> Playback devices -> Communications tab”? Or the Dynamic (fluctuating) volume when there are 2 or more active sound sources? I am not sure how to trigger the issue. It appeared while switching between speakers conencted to sound card and USB DAC that I plugged my headphones in. At the beginning I thought my discord broke but turned out that only the volume was reduced. It doesnt silence applications completely, just reduces volume to 0. My os version is 1709 and compilation is 16299.192. I disabled exclusive mode, not sure if it fixes the issue yet. I never activated SVN and the communication tab is just as Chris shown on his screenshot. Have you tried disabling the realtek sound adapter in the BIOS settings? There’s definitely some kind of loudness equalization or protection going on apart from the controllable sound enhancement, and it does seem to be on system level (as in it is present for every audio device). It also seems to me like it got worse with the current April update (1803), which is why I was trying to do something about it. 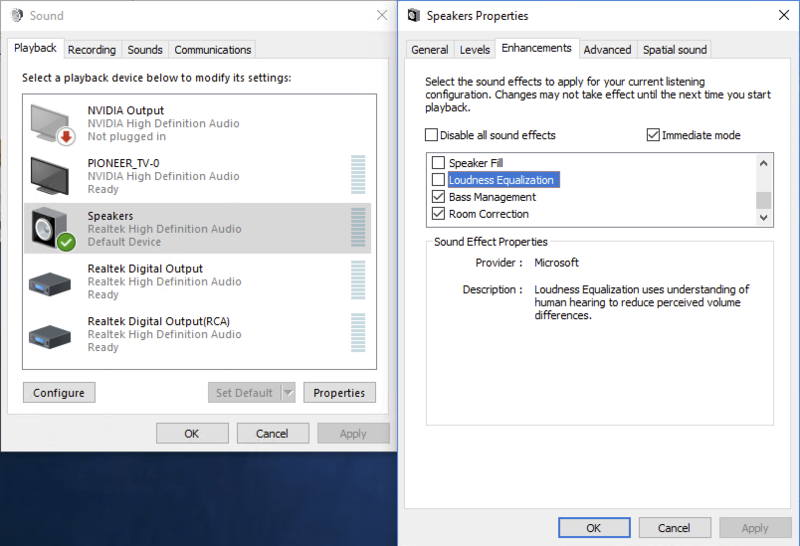 However, you will find the loudness equalization is disabled there, but if you play a loud audio file, Windows will still lower the volume accordingly to avoid clipping. The only way I was able to avoid this was to disable the audio enhancements for the given device completely. And, to be honest, I don’t really notice any negative effects from doing so – everything still seems to work fine except for Equalizer APO itself which requires the enhancements to be enabled. But apart from that…no noticeable problems. I can even use Dolby Headphone just fine and use 7.1 audio. Also, the difference between the regular Loudness Equalization and the thing Windows does on its own is that Loudness Equalization lowers volume of loud sounds AND raises the volume of quiet sounds, while the Windows thing does not amplify quiet sounds, it only lowers the volume of loud ones to avoid clipping. Equalizer APO with HeSuVi seems to accentuate the issue as well for some reason, at least in my experience. I wouldn’t even really notice it without it, but with it, it’s very noticeable. So who knows what’s actually going on there. By the way, did you (or anyone else) report it to Microsoft. Maybel they’ll fix it, eventually. I might, eventually, but I’m also trying to get to the bottom of it the best I can before that. It seems like I might’ve spoken a bit too prematurely about it being on the OS level. Did you manage to figure out what’s going on? Well, in a way. It’s not Win 10 specific, that’s clear now – I’ve managed to replicate it on Windows 7. Win 10 might be a bit more willing to adjust the volume, but I might also be just imagining it – take this with a grain of salt. ANd it’s most noticeable when using HeSuVi – without it, it’s much harder for me to trigger it. It also seems to indeed somewhat depend on soundcard driver – the volume adjustment that happens seems to have different characteristics on my Xonar and on my Xfi Titanium HD, as in the “attack” and “release” of the effect seems to be much shorter on Xonar, making it more noticeable. As for what actually happens…I only have a vague idea thanks to HeSuVi documentation and features. There’s a recently added function in HeSuVi to “Store the final sound in side and rear channels as well”, which is explained as “allowing for louder volume before Windows applies its clipping protection”. And for me, activating this option drastically reduces the effect when it happens. So I guess it’s that “clipping protection” in action. You should set this as well if haven’t https://imgur.com/a/resEY and check if SVN is disabled as well as described in the second link Carved posted. Are there any tool like “fpswitch-new-version” that changes between “SPEAKER” and “FP HEADPHONE” by simply clicking the exe? No running process or fuss. Maybe author of fpswitch-new-version can add some kind of .ini file support so we can put which output device we’d like to switch between. I really like low DPC/latency mode of Xonar Uni Driver. I love how it sounds and i don’t need to use any feature on the ASUS control panel. My speaker (rear) and headphone (FP) is always connected. So i’d love to switch between these two without running ASUS/CMedia/etc control panels. I do believe what i am trying to do is pretty common, i hope someone already modified fpswitch-new-version and maybe willing to share? I really wanted to try this driver on my new stxii but can’t get my system into “test mode”. It’s being blocked by something called “secure boot” which I can’t find a way to disable. Being as I’ve disabled the onboard sound I’ll have to use the Asus driver. “Secure boot” option should be in BIOS/UEFI. Before disabling that you could try the Disable Driver Signature Enforcement method and see if it works. Let me know if it worked. If all else fails, you could install the “b” version of the drivers because they do not require test mode for your card. Thanks for the reply Carvedinside. I tried three times to use the “Disable driver Signature Enforcement” method but each time it did not give me opportunity to press 7 or F7 to select it so it just booted into windows normally, so I gave up on that path and installed the “b” version as you suggested and it did indeed work 🙂 so I’ll stick with that version. It has not however fixed my problem of the STX2 not picking up the mic on my new Beyer MMX300 Gen2 gaming headset. With your driver it will detect and work with my “Modmic 5” which it didn’t before. With the MMX300’s it pops if I click any of the buttons on the inline remote or touch the plug on the detachable headphone end but no sound on any port even on PC through the mic, even with the mic boost on. Oddly the gen 2 headset also comes with a shorter lead meant for connecting to mobile devices and this only has a single combined termination instead of splitting into 2 (mic and headset) and if I connect that combined plug into the mic port on my front panel the mic on the MMX300’s works! But this of course leaves the headphones not working. I’ve spent literally 12 hours on this playing with all the sound settings, defaults etc. so I’m going to give up for now and maybe try a USB DAC just for the gaming headset and leave the STX2 just for listening to music through my Sennheisers which do sound much better through the new card. Sorry for the epic post but I wondered if anyone else had tried the combination of the ST2 and the MMX300 gen2. OMFG! After all that buggering about I finally came across a post about people sending back their Beyer’s because of the mic issue. Wrap a tea towel around the plug to the headphone cup and push as hard as you can with a pair of pliers until it clicks and I’m a steel fabricator who can pull a beer bottle top off with my bare hands. You really have to push that hard! All I need to figure out now is why the audio channel selector is stuck on 6 channels :/ Sounds awesome though. Is it necessary to buy/install Dolby Atmos to get Dolby Headphone to work in Windows 10, or is the setting in the c-media panel enough? No. Dolby Atmos Windows 10 app and Dolby Headphone Xonar driver option are each their own thing. Use one or the other. I did everything possible already, reinstall, run as admin, DDU, bla bla, offical drivers, trying older Uni Xonar drivers, disable driver sig enforcement etc, NOTHING works. Mic is dead. Is this purely Microsoft’s fault or can a newer driver work around this? With the Xonar card are you using the front panel microphone connection? If you do, try connecting it to the rear of the card and disable Front panel mic in Asus/Cmedia Panel. Check if the microphone works with the onboard audio card. If this would work, you can still use the Xonar card for playback. Dont use front panel and its off already, as having that on stops it from working before. Onboard realtek mic dont work either, on my laptop with realtek as well, its integrated mic also stopped working. Thank you for the followup information. You should report the issue with the details to Microsoft Windows support. For me, it’s working properly with a D2X, DG, and a DGX as well with Realtek sound. Could only advice a reinstall but if you did this already my last idea is that your Mic might be broken. Can you check this on an independent, not RS4 device? BTW which driver version? In Win 10 RS3 with Unixonar 1.81 doesn’t work Line In pm Asus Xonar STX2. Isn’t it RS4 aka Spring Creators Update? When i use a microphone on my ASUS Xonar DGX + Unified Drivers, the mic’s sound can only be heard in the left ear. I don’t have that problem on the stock ASUS drivers. Where have you noticed that? Are you using Microphone Monitor option? How about if you are recording the sound? Which OS version and build number do you have? Which UNi Xonar drivers have you tried? Which version were the original drivers? Microphone is connected to the front panel or directly to the card? With the system in the current state I suggest you check again with original drivers, then check with several versions of UNi Xonar drivers and report back. I am on win10 1709. I wonder which one of the drivers is the most stable for me? Thanks. Could not find a search function for the comments. Weird issue here: Listening to music while in 192k (either 2 channel or 7.1 Dolby upmix), there is a sort of “warbling” noise or type of distortion that is very noticable when the music you are listening to has a sustained note in it (like someone singing a single phrase at a single note) . I’ve tried different players, as well as stock drivers but it is still present. This can be “fixed” however by running DPC Latency Checker in the background. I found that while measuring latency (which is at ok levels), I couldn’t reproduce the weird sound effects – but as soon as I would close the application the issue would re-assert itself. Is it version 1704 or it was a mistype? On version 1709 and the settings reset bug, I’ve mentioned that it was fixed after an update. using DGX Xonar with Unixonar, trying to use SVN from the Asus center and it seems very hit or miss but windows doesn’t let me use enchantments, any ideas on whats wrong with SVN that would cause problems? i did a fresh install of all audio drivers and disabled whatever isnt related to xonar. Also is there are relation to them? Both linked drivers are customized C-media original drivers to allow installation on Windows 10. UNi Xonar are also based on C-Media original drivers but with added fixes (see UNi Xonar Features) and updated components. Basically UNi Xonar drivers are superior to those drivers and to ASUS and C-media drivers. A slightly different question: I know these include Creative latest 2.1.0.0 OpenAL, but does OpenAL-Soft work with them? I ask because some games (particularly opensource and indie) prefer it to Creative’s version? Also does the official OpenAL have any sort of config utility like alsoft’s “alsoft-config” app? Or do the card’s settings panels do all that? Don’t know. I would guess it works. OpenAL does not have a config application, I think it uses settings from games. HELP! My microphone is not working after the latest April update from Microsoft for Windows 10. It is of course sat as my default device. Sound is working to my headphones. I have the Essence STX sound card. Tried reinstalling drivers with clean install. No luck. Any tips?? Which drivers have you tried? Does the microphone work when connected to the onboard card? Check this solution and let us know if it worked. Update: Check this guide for step by step instructions. Fresh install, Win Pro 10×64 17133. Low latency panel. Got a lot of cracks, overall volume is way to low. Going to check other panels, original drivers and onboard card so I let you know. In my testing I didn’t have any of those problems. I have tested Win 10 version 1803 RTM (build 17134.1) and used UNi Xonar v1.80a drivers. I only tested listening to music while web browsing and doing some stuff in Windows 10. It could be that it fixed in the latest Windows 10 stable build or your system is affected by some new Windows 10 bug. You can also try older UNi Xonar releases see if with those things behave differently. Let us know of your findings. If you manually install only the driver as presented here (Possible solution 1) does it work?